There has been a strong trend for Spanish food for quite a few years now. It started with Moro, Sam and Sam Clark's iconic Moorish restaurant and the high quality food importer, Brindisa. Then the latter opened their tapas bar in Borough Market . . . I walked past it last night and it was packed to the gills. More recently El fantastic Faro opened its doors with an enticing blend of modernity and tradition. Add to this Salt Yard and a couple of others and it would seem that duff paella is a thing of the past. Many of these new restaurants place the grill at the heart of their cooking, they are trying to bring a sense of the asador to London. In many places it works and such a simple style of is an attractive prospect for a new Spanish restaurants. The simplicity of the grill is deceptive though. Ingredients will be shown in a straight forward, honest way and this means the quality of ingredients used will face immediate scrutiny. Could the boring grill become the new bad paella? I'm getting ahead of myself . . . two paragraphs in and I haven't even mentioned the restaurant yet. And you can probably already guess the gist. The visit was bit exciting to start with. Jay Rayner, the Observer's restaurant critic, had already kindly given us a mention on their blog. When he emailed Ben asking to join him for supper this sounded good. And where were we going? Camino . . . A new Spanish restaurant in King's Cross that I'd walked past a couple of times and been eager to visit. Ben and I arrived first and sought recommendations from the bar. We were told that the Cruzcampo was good. Not an impressive recommendation in my book, especially when they had Alhambra beer as well. We started off quite liking the interior. It's on two levels with a large bar stretching around to accommodate both, there is a large skylight making the place, er, lighter. Later on the place started to seem more and more like a motorway service station, admittedly a continental one . . . there are even road signs on the walls. This is, of course, because camino means 'way' or 'route' (any Spanish speakers feel free to leap in here as I don't speak it). The idea is that you can take a walk through various regional styles of food. This is illustrated on the funny little concertina menu by placing the dish descriptions along the length of a road. Or maybe it was a river. As to the food . . . well, it was just a little boring with some mistakes in execution. 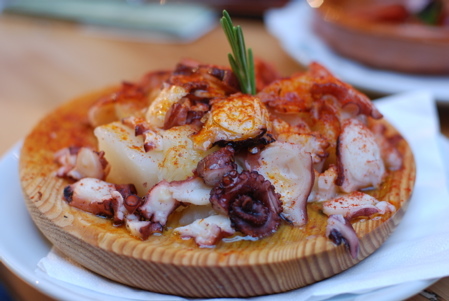 We ordered Jabugo ham, Galician octopus with potatoes and a mackerel escabeche. The ham was at the right temperature (i.e. not cold) but was sliced too thickly. The octopus was unexciting and lacked vigour, despite a sprinkling of paprika. The best of the starters was the escabeche, flavourful and just firm enough with a light citrus marinade. Next I declined the chance to join in with Ben and Jay in tucking into some Charolais beef and went for some Romney Marsh(!) lamb cutlets instead. I'd had an enormous Ginger Pig T Bone steak the day before so I couldn't even look at anything cow related. The verdict on the beef seemed to be that it was ok, just rather boring . . . boring is not good enough for beef, after one mouthful you should be involuntarily slobbering and muttering, 'oh yes' (That is what happens at Hawksmoor, Santa Maria Buen Ayre, El Faro etc etc.). Maybe for my lamb they were too reliant on natural seasoning. Salt marsh lamb can be delicious but this lacked flavour and should have been more strongly seasoned. To accompany this we had pan roasted potatoes with onion, green peppers and egg. These are knockout ingredients but again Camino's dish seemed to lack soul. We rounded things off with an almond tart, crema catalan and 'pastel de chocolate caliente' that seemed to be like a fondant. A chocolate fondant should gradually change from a soft spongy outside to a liquid core. This dish leapt from a too thin, dry outer sponge layer to a flood of liquid inside, suggesting it had just been cooked too quickly. The reaction to the other two desserts was not overly enthusiastic. Well, what a shame. This kind of cooking, when done properly, can be hugely satisfying and quite exciting. Not here though. That night, at least, the place seemed to lack attention to detail and care about what they were doing. Service was patchy too, requests for further drinks were randomly intercepted and variably interpreted. If you're in King's Cross, there are better options.